Paper.li allows users to create curated online newspapers drawing content from Facebook, Google+, Twitter, RSS feeds and YouTube. 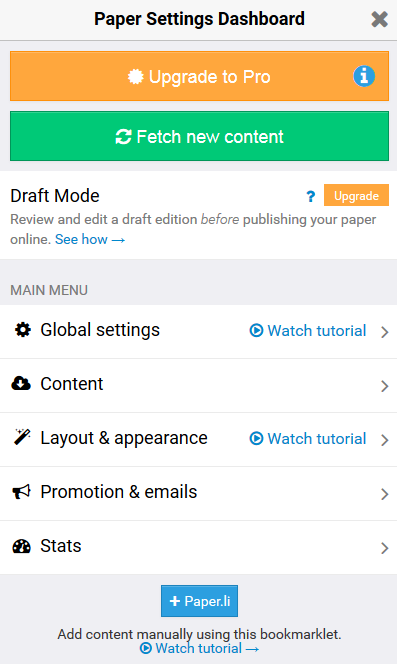 Once content has been added from various sources to create the paper the user can edit the settings of the paper, such as set publishing schedule, edit layout and appearance, add widgets etc. The online newspaper is then updated depending on the frequency set by the user. 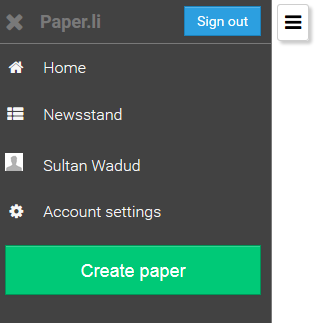 1) Once you have signed up to Paper.li using either your Facebook or Twitter account Enter the title for your paper and then click the Next button. 2) Search for content from various sources, such as Facebook, Google+, Twitter, RSS feeds and YouTube to add to your paper. 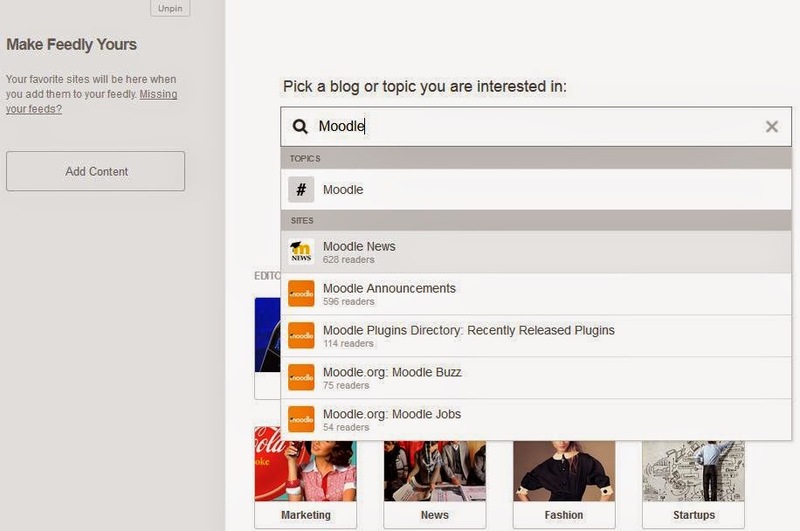 In the example below I have searched for content related to Moodle. Content can be added to your newspaper by clicking on the + (green plus) icon. 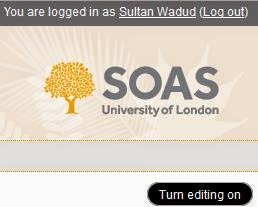 3) Click on the Create my paper button once you have added the content sources. 4) After you have published your paper you can edit settings. To edit settings, click on the gear button on the top right corner. When you click the Edit button you will notice each block will have some additional options which will allow you to reposition the block, make it your featured article, delete or block and future content from the individual or site. 5) Under the Global settings you can edit basic settings such as Title of paper, Subtitle of paper and Editor’s note for your paper. To set the frequency of how often your newspaper updates its content click on Publishing Schedule. Update frequency – set to twice daily, daily or weekly. Time – specify the time you would like your paper to be updated. Timezone – Select the relevant time zone. 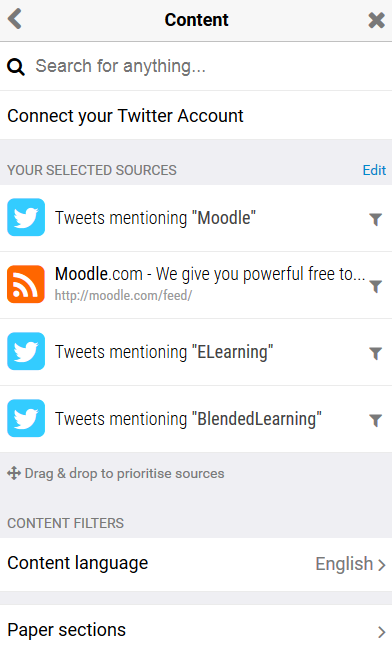 6) Content - add the content sources for your paper either but adding sources from additional searches or by using ‘drag and drop’ from content sources. 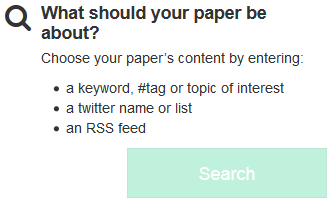 Your Selected Sources – A list of all the content sources that is associated with your paper. You can deleted items or filter the content further by specifying keywords to include or exclude. Content language - select the language for content that will be displayed in your paper. 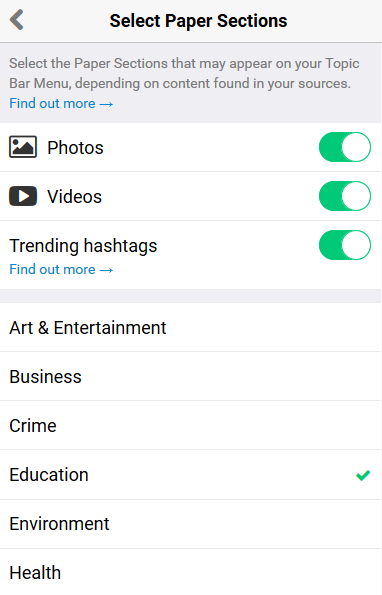 Paper sections: Select which sections in your paper like images, videos, trending hashtags and categories you would like to be added to your paper. Click on the Fetch new content button once you have made the changes and then click the green confirm button. Look and feel – this menu is pretty self-explanatory in that it offers you the options to change the appearance of your paper. 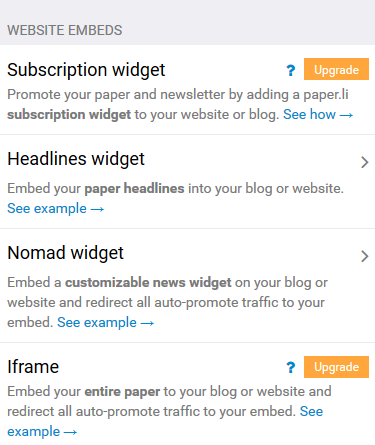 Layout widgets – allows you to enable certain widgets to be displayed in your paper. Twitter widget - set up and enable the Twitter timeline widget, first logon to your Twitter account and settings section you will notice a widgets option. Amend the options as required in the next screen and then click Create widget. 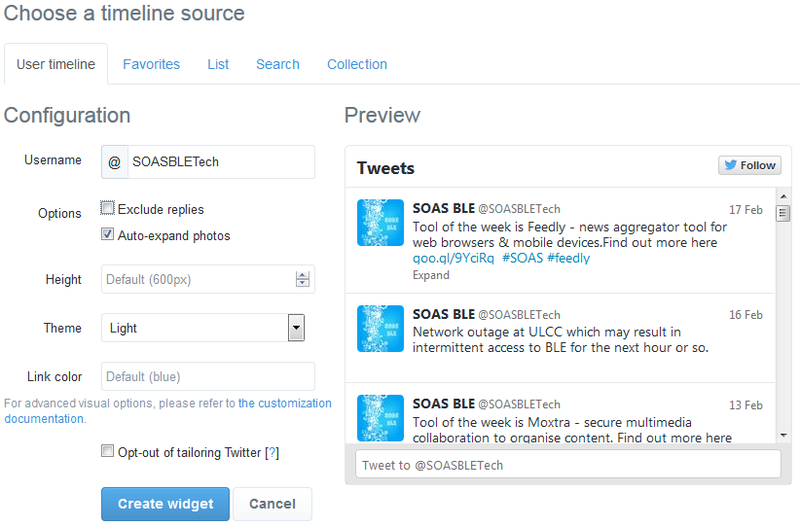 Finally copy and paste the HTML embed code into the Twitter widget section in your paper (ensure Twitter widget is on). Save to finish. 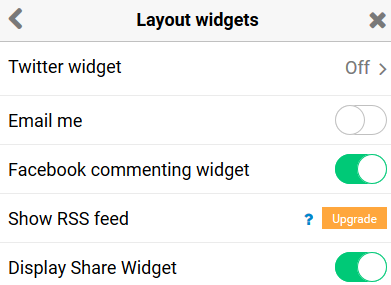 Other widgets – switch on additional widgets for Email me widget, Facebook commenting widget and Display share widget. 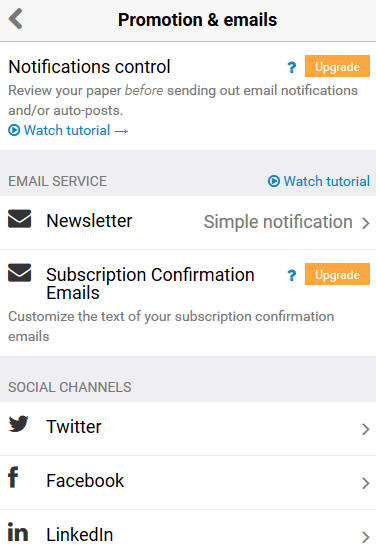 Newsletter option – switch this option on to allow email newsletters to be sent to subscribers. 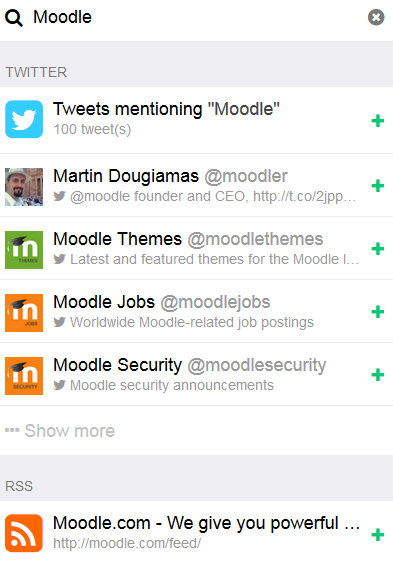 Social channels – link other accounts like Twitter, Facebook and LinkedIn to your paper. Headlines widget - generate HTML codes of paper headlines that you can embed in a blog or website. Nomad widget: generate HTML codes of paper news that you can embed in a blog or website. 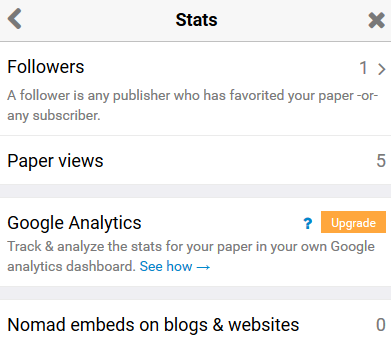 9) Stats - This is useful feature that provides statistics on the number followers, total views and number of embeds on blogs and sites your paper has had. 10) Change account settings – to make amendments to account picture, account name, profile description and edit email notification settings click the Menu button on the top left hand side and then clicking the Account settings option. Feedly is a news aggregator tool for various web browsers and mobile devices. The Feedly works is that it aggregates, or gathers RSS feeds (method used by websites to disseminate information to all of its subscribers). The cleaver part of Feedly is that it has a built in aggregator which captures and organises, feeds to make it easier for the reader to absorb the latest news. So the benefit to the reader is that they no longer need to keep checking a website for new content, Feedly now collates and updates this for you so you only need to look at one place. 1. Setting up a Feedly account was fairly easy process, you are given a use a choice of Facebook, Google +, Microsoft or Twitter to sign in to create your account. If you know the address of the website URL or its RSS feed then you can paste this directly in the search bar. Using the search is useful to locate content from a particular website, all you have to do is paste the address of the website then hit search and Feedly will check to see if the webpage has any RSS feeds. 4. 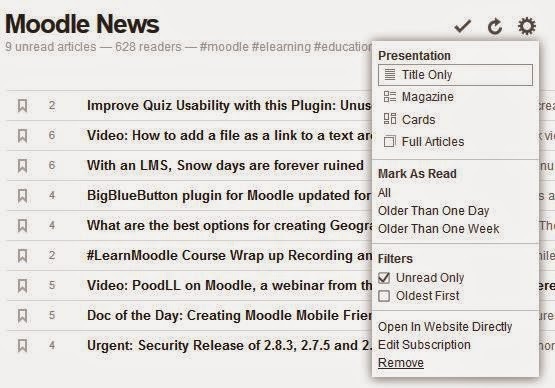 Click on the +feedly green button at the top of the page to add Moodle News feed to your RSS feed. You then will be prompted to give the name of the feed and also if you wish to add it to a collection. You can leave the suggestions as they are or amend as required. Once you are done click the Add button. 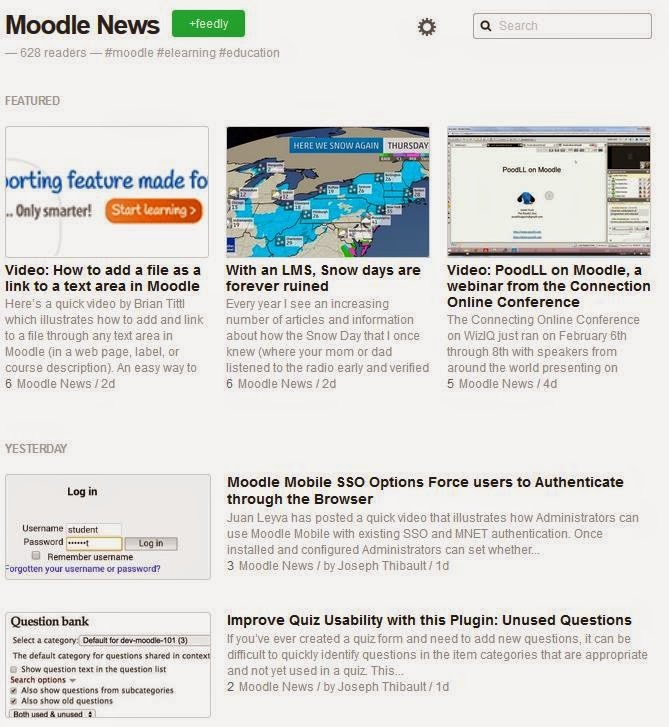 Now you will see that Moodle News has been added to the collection titled Moodle. 5. 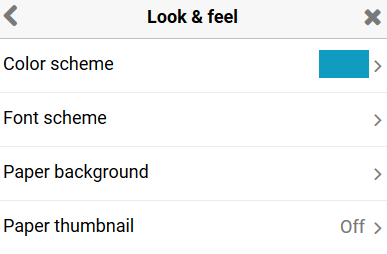 You can alter the layout of your home page by clicking settings button at the top right hand corner. 7. When searching for topics you will notice that Feedly will show you recommendations under Related Topics at the top of your search result. This is a great way to add relevant content sources to your topic to build up your collections. 8. If you decide you no longer want to follow a feed simply click on the feed then click on the setting button and then select Remove. 9. The bookmark is a useful feature if you want to save something to read later. When viewing the content click the book mark icon towards the top left hand side of the page. Moxtra essentially offers users a secure multimedia collaboration binder to organise content on your desktop or mobile device. 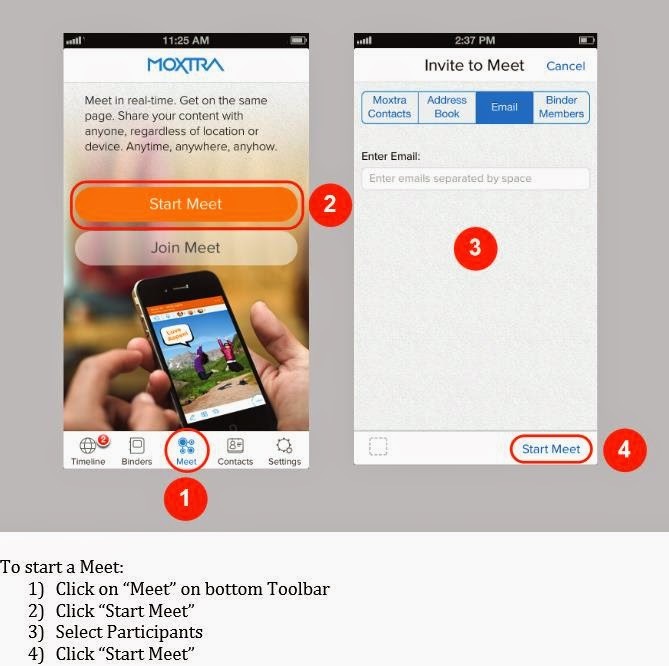 With features such as online chat and conferencing Moxtra offers a complete package for teams to carry out meetings about documents entirely within the app. Users can access Moxtra on a range of devices whether it is mobile, tablet or desktop the service can also be accessed via any browser. With Moxtra’s commenting and annotation (including voice) tools you can add comments to pages with real time updates and notifications. Binder - is a place to keep all related multi-media content and conversations together. 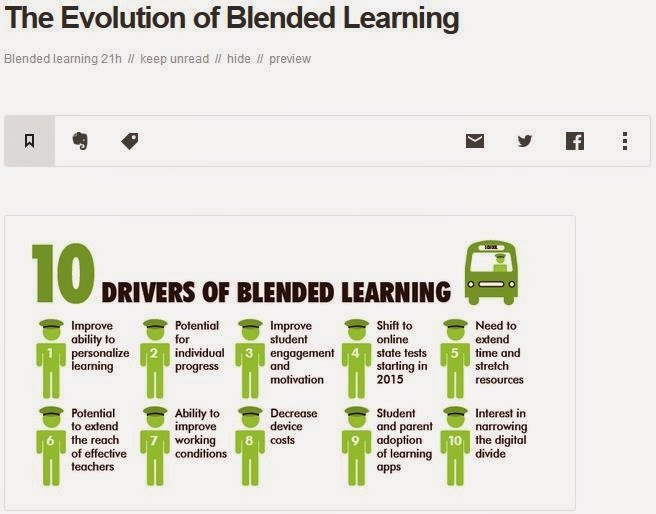 Users can create a binder for each topic, and share the binders with others working on the same topic. The Binder allows users to store files, chats and to-lists within each binder that can be easily accessible. 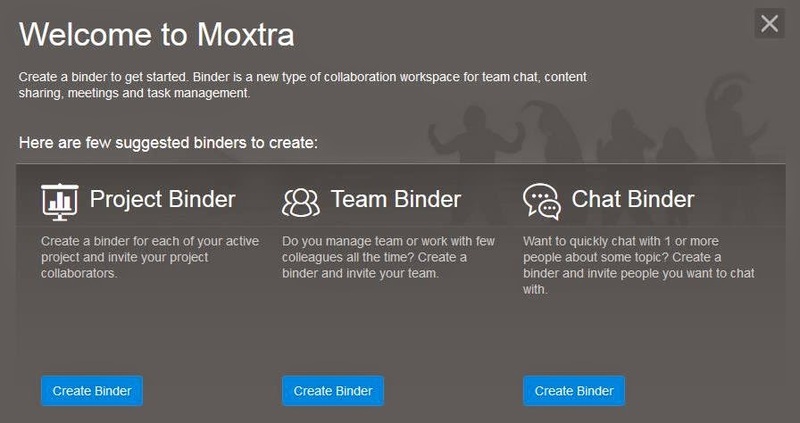 The Binder tool facilitates a workspace for teams to work collaboratively utilising Moxtra’s messaging, multimedia annotations, meetings, and task management features. The Binders also allow teams communicate, share content, arrange meetings, and tasks in one place; instantly searchable, shareable, and actionable. 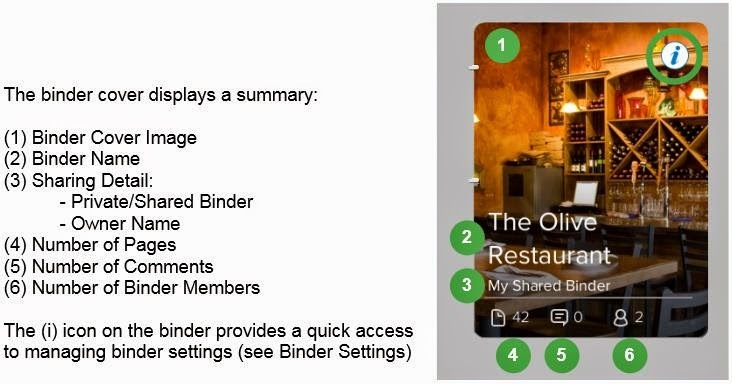 Within a Binder there are options to share content with team members including the ability to assign roles as viewers or editors. 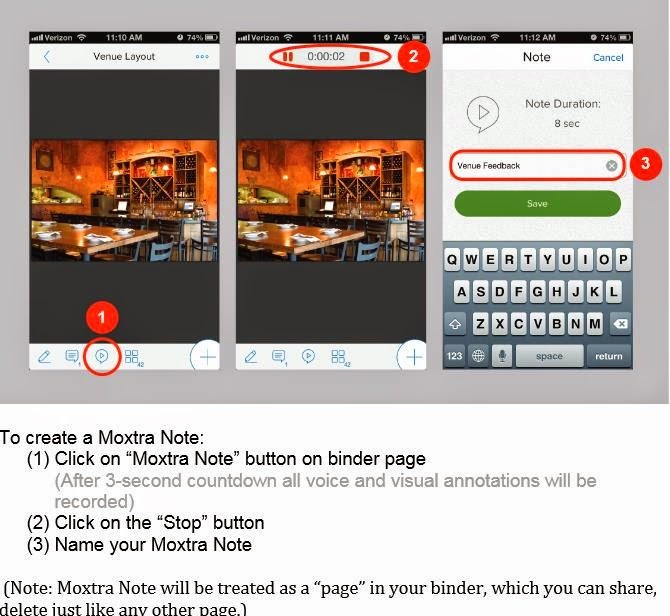 Moxtra allows users to pull in data from Google Drive, Dropbox, Box, and Evernote into a Binder. The chat tool allows team members to have conversations with one or more team members similar to how you would use any instant messaging app. Chat can take place either inside or outside the Binder. 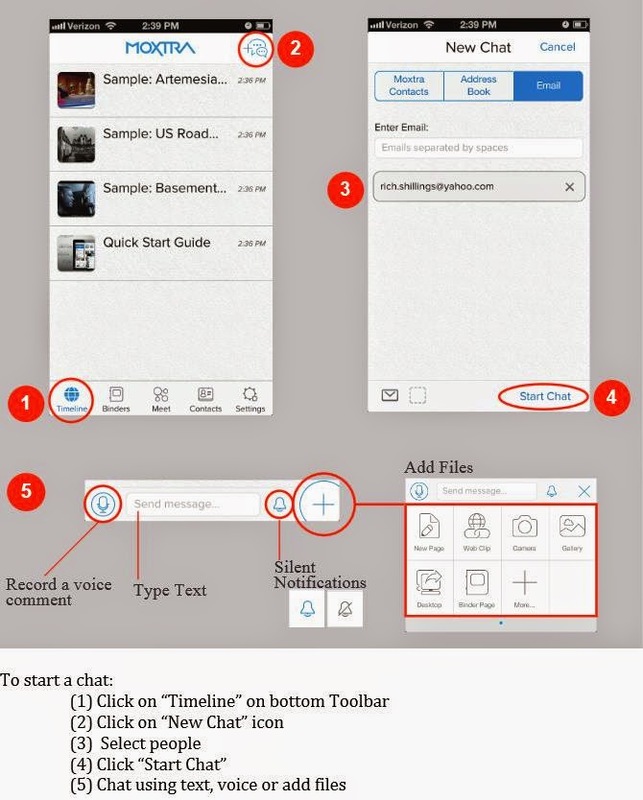 The chat function allows users to share documents, pictures, audio and videos. Teams can use the chat conversations for future reference for any decisions made or topics covered. Meet allows users to arrange ad hoc or scheduled real-time meetings to view and discuss documents to make annotations together online or using the mobile app. One useful feature of Meet is that the convener of the Meet can share their screen, or hand over the responsibility of chairing the Meet to another participant, in real time. With the Meet feature users can share their screen, do a presentation, communicate between participants and even record the meeting so it can be played back at a later time. The Notes feature allows for small audio or videos to be recorded and placed within the chat stream or Binder pages. They can be played back later by others, or even shared via email or YouTube, or saved to a camera roll as a video. Panopto allows faculties to capture their lectures so that students may view them at a later date, through a web browser. Panopto also has a note taking mechanism that allows students to type in and save notes as they watch the lecture recording. • A folder is created on the Panopto’s server where the course recordings are stored. 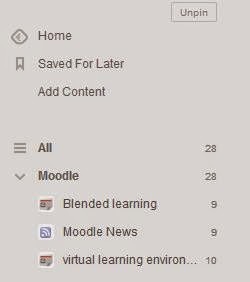 • Your Moodle account will have access to that folder which included ability to create and manage recordings. 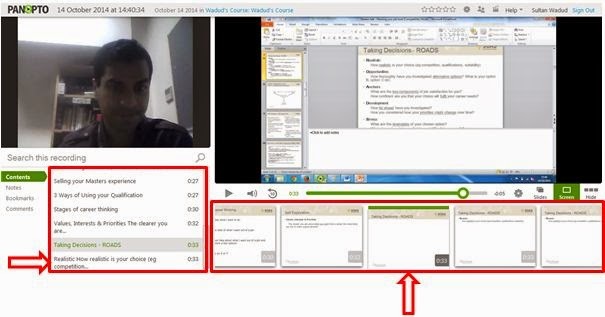 • Granted the students on your course access to the folder to view recordings. Navigate to your course and select Turn Editing On. 1. Click on the Add A Block dropdown menu and select Panopto Focus. 2. This will create a new block on the right hand side called Panopto Focus. Click on Actions button. 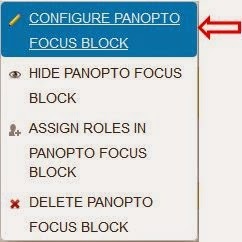 Then click Configure Panopto Focus Block. You will then see a confirmation screen of the add users who will have access to the Panopto folder. 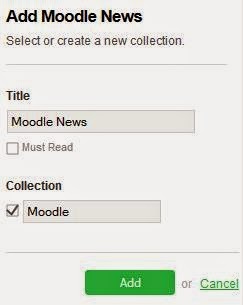 Please note: When you provision a course from Moodle into Panopto, it is a point‐in‐time operation. This means that if students enrolled onto your course after the provisioning occurs, Panopto will not know about it. Therefore you should periodically re‐provision your course by following steps 3 to 4 again to update the user list so it is synced with any new participants. This guide will help you show you how you can record a Panopto recording. Before you start making your recording make sure all of the equipment including your microphone and camera are plugged in before you open Panopto. If you find that Panopto cannot locate your equipment, please get in touch with the AV (audio visual) team. 1. Click on the arrow pointing down button on the right hand side of recorder window. 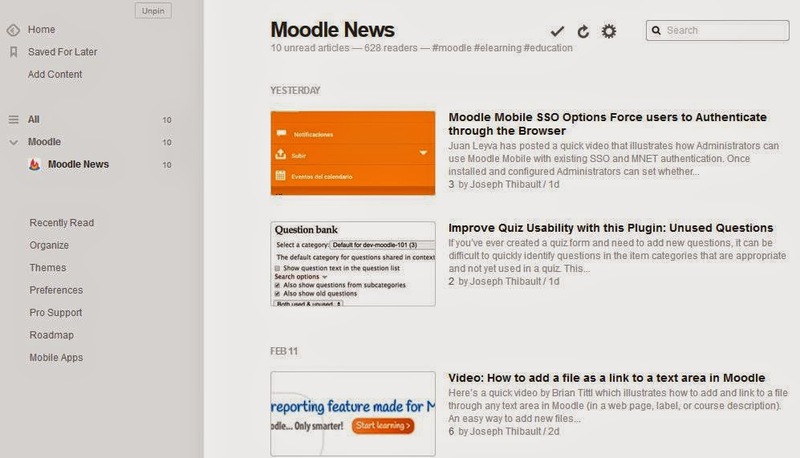 You will see a list of Moodle courses that you have provisioned into Panopto. 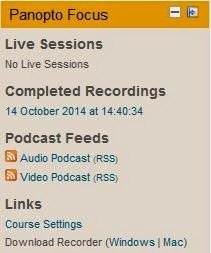 Please note: If you have not already provisioned your Moodle course then you will need to do this first before making any recordings otherwise the recording will not be linked with your course and it will be placed in a ‘holding folder’ until you do so. 2. Hover the mouse cursor over the course you wish to create a recording in and click the button Add New Session when it appears. 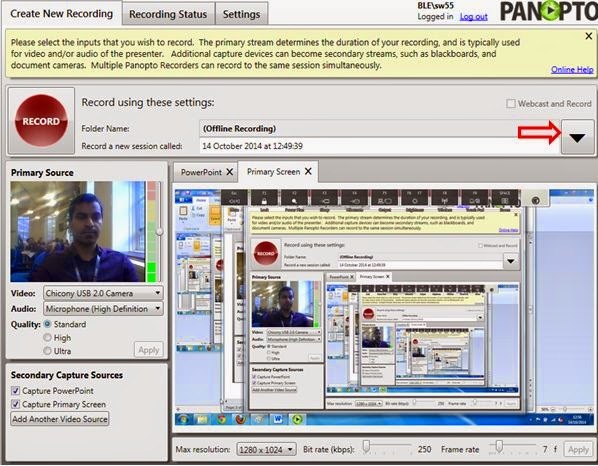 You will then be returned to the Panopto recorder window and you will notice that Folder name changed from Offline Recording to the name of the folder (course) that you selected. Primary Source - section ensure that the correct Video and Audio sources have been selected. By default Panopto will select what is available to it. By default the Quality is set to standard which is configured for web quality however you can change this to high quality if you wish. Ensure that you test your audio by talking into the audio device provided and check the Input levels bar on the side of the video which will change from green/yellow/red to see if activity is being picked up. Secondary Capture Sources – by default both Capture PowerPoint and Capture Primary Screen are active. If you are not using one or both of them then simply deselect the box. Primary Screen – Here you will see a preview of what is due to be recorded. Towards the bottom of this block you will see options to change the quality of the video including Max resolution, Bit rate and Frame rate. Please note: you cannot change the frame rate once you’ve started recording! Panopto allows for indexing of PowerPoint content which allows students to search within a recording for specific words used in your PowerPoint as well as being able to navigate through the recording by an index of slides. This function is active by default. 1. Before you start your recording open up your PowerPoint presentation first. Alternatively you can open up the presentation from Panopto by clicking on Open a Presentation. 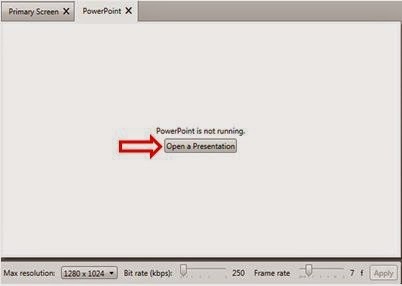 Once the presentation is open Panopto the prompt message to open the presentation will disappear. 2. Once you have your presentation ready and all your settings configured start your recording by clicking on the Record icon and then minimise the Panopto recorder window. Click the Pause button any time during the recording to pause the recording. For example if you gave a break you may want to pause the recording. Just make sure to unpause the recording when the break is over. To unpause and continue recording click the Resume button and minimise the Panopto recorder window. 3. When you want to finish the recording click the Stop button and the status will change to Recording Complete. A message notification will pop up to inform you that the recording has been completed. Click the OK button. This will then take then you to the Recording Status screen. Whilst Panopto is uploading your recording to its servers you will see Processing and Queued for encoding against your record. Once your recording has finished uploading you will see View, Edit and Share options appear. Please note: the process of uploading can differ depending on how long your recording is. This process takes place in the background (running as a service), so you can exit Panopto and log off from the computer and the upload will continue to process. However do not turn off the computer! 4. Click View to play your recording. This will open a new window to display your recording. If Silverlight is not installed on your computer then you will see the Activate Silverlight message in the video window. After you click Activate Silverlight you may see the Allow soas.hosted.panopto.com to run “Silverlight?” popup message, just click Allow and Remember to continue. Once Silverlight has been installed you will be able to play your recording. 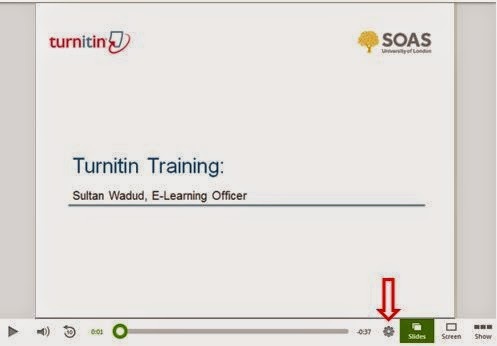 You can jump to certain parts of the recording either by click on the contents box or the slides in your presentation. 5. Notes - You can add notes to your Panopto recordings by clicking on the Notes menu option. Time stamp - As soon as you start typing a time stamp will be inserted in the viewer. Save - To save the text either hit Enter/ Return. Edit / delete - click on the note you wish to change and either click edit or delete buttons that appear. Privacy - By default, notes under your username will be private, i.e. no one else can see your notes. You can make your notes visible by clicking on Make public (see above). 6. 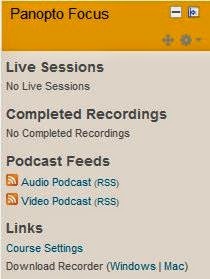 Bookmarks - You can bookmark specific times in a recording that you want to return to. Upon logging in, you will see a tab on the left side for marked content. Once you click the bookmark button you will be prompted to label your bookmark at the time of entry. Enter a note for your bookmark in the text box, and hit enter to save. 7. Comments - Comments provide the option to leave feedback or general commentary that is publicly notes and bookmark, simply type into the field below and hit enter to save. You will see the timestamp of when the comment was made, along with the associated username. 8. The Panopto player lets you seek through your Recording as well as allowing you to control what you view. Overview – This will allow you to amend the recording title, which folder the recording is saved, the creator of the recording, when the recording was created and the duration. You can also insert a description for the recording by clicking Edit. 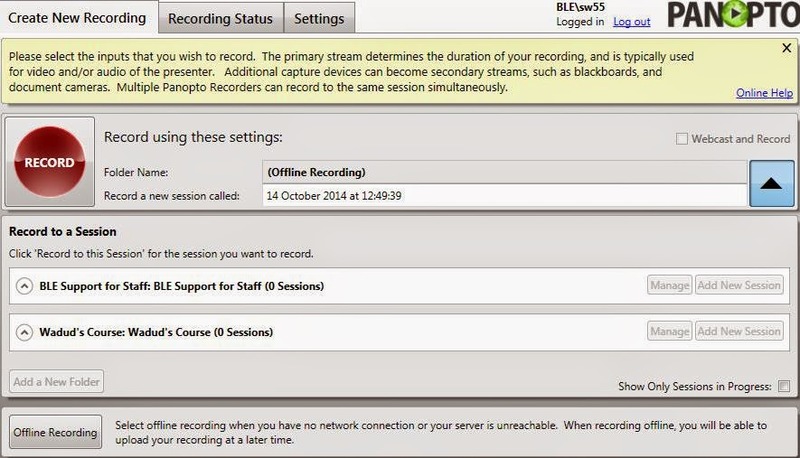 Share – Displays a list of users within your course that have access to the recording. If you wish to make your recording available to multiple courses, to anyone on the internet then select from the or to a selected group of users then select the following option towards the bottom of the page from the Shared tab. Outputs – Select how you wish your recording to be available such as an embed code, or download the video or audio podcast. By default it will be set as the Panopto Web Viewer. Streams – This allows you would upload a pdf document or transcript for your recording as well as displaying what elements make up the recording including video, screen capture and files. Captions – Can be uploaded in either DFXP or SRT XML formatted files. Manage – Here you can copy or merge recordings if you plan to do post production editing. Log – This is a running record of all the activity that has taken place relating to the record. This may be useful for troubleshooting.